The story of the legendary rock band Queen and lead singer Freddie Mercury. With a US gross of $209 million, Bohemian Rhapsody didn’t crack the 2018 top 10. However, it must be considered the biggest surprise hit of the year, as it beat all expectations and turned into a definite “fan favorite”. In 1970, Farrokh “Freddie” Bulsara (Rami Malek) works as a baggage handler at London’s Heathrow Airport. He aspires to something more, however, and when he hears a band called Smile at a club, he convinces them to make him their lead singer. Soon rechristened “Freddie Mercury”, the band changes their name to “Queen” as well and they work their way up the music business ladder. This leads Freddie and his bandmates to great success along with various personal issues. Given the movie’s popularity and its Oscar Best Picture nomination, it becomes easy to forget that the initial reviews were generally mediocre. Indeed, the critics were so down on the film that I intended to skip it theatrically. However, all the glowing word of mouth prompted me to give it a look. Can 50 million Elvis fans be wrong? In this case, yes - yes, they can. Rhapsody isn't just a bad movie, it's a trainwreck, a mess of such epic proportions that I can't even vaguely comprehend all the positivity sent its way. Spoilers ahead - you're warned! Let's get it out of the way: factual errors really become a problem, as so much of Rhapsody comes built on fiction. I don't even mean the supposed "nitpicking" about song release dates, such as the movie’s indication that 1977’s “We Will Rock You” was composed in 1980. Instead, I mean the invented nature of the drama. The screenwriters decided to use 1985’s Live Aid as the band's ultimate moment and build the entire film around that - fair enough, I guess, as Live Aid was arguably Queen's last real hurrah in the global spotlight prior to Freddie's premature death in 1991. Unfortunately, this choice means the screenwriters then need to shoehorn in so much imaginary content that the movie becomes a mess of cliches and melodrama. Rhapsody actually manages decent entertainment during its first act. Sure, it embraces the usual "band comes together" clichés – also fictional - and the underdrawn relationship between Freddie and his dad (Ace Bhatti) reeks of The Jazz Singer. Nonetheless, the story moves at a fast pace and the viewer gets swept up in the excitement of the band's ascent. The story starts to collapse around the time of the title song itself, mainly because that's when it decides it needs to a) even more seriously rewrite history, and b) veer toward standard rock band movie melodrama. Essentially the story eventually decides it must pit Freddie against his bandmates, so it creates artificial tension and a breakup that never actually happened. We're told that Queen hadn't played together for years prior to Live Aid, whereas the long Works tour ended barely two months before that famous event. Conveniently, this allows the movie to ignore Queen's controversial performances in apartheid-era South Africa, though I'm not convinced it would've included that information anyway. 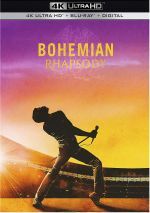 Rhapsody doesn't want to tell the Queen or Freddie Mercury stories - instead, it wants to give us a cliche "rock star gets too big for his britches" tale with the requisite schmaltzy ending. Never mind that little of this appears to be accurate. The portrayal of Freddie's relationship with Jim Hutton (Aaron McCusker) becomes laughably fictionalized, especially when the movie reunites them on the day of Live Aid. And then Freddie brings this guy he barely knows at all to meet his parents, all while a global audience of millions awaits! Crazy stuff, and it doesn't stop there. Live Aid presents a reunited band – the one that never broke up - and posits that Queen saved the fundraising side of things. The scene in which Bob Geldof (Dermot Murphy) glumly surveys a bank of silent phones causes massive eye-rolling, and it acts as a huge insult to the other artists, as it implies only Queen could shake money out of the punters. The whole made-up conflict within the band really grates the worst, as it forces the movie to completely leave the realm of reality. I know, I know - it's not a documentary. Nonetheless, Rhapsody presumes to give us a tale with at least decent grounding in facts, and the leaps of truth just become far too much. One more time: the band that "reunites" for Live Aid played a massive tour that finished two months earlier. This lie bothers no one else? Bizarrely, Rhapsody obsesses over trivial details. The filmmakers go to pain to get the right kind and number of Pepsi cups on Freddie’s Live Aid piano, but they don’t care about what year songs came out or when Freddie found out he was HIV positive. Sigh. Even if Rhapsody boasted 100 percent accuracy, it'd be a mess because it traffics so heavily in schmaltz. I thought I accidentally tuned into some sappy chick flick on the Hallmark Channel, as the movie makes every cheap heart-tugging move it can muster. These don't work. 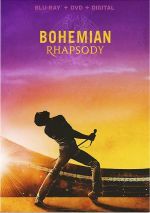 Like I said, I find moderate enjoyment from the first act, but once "Rhapsody" wanders down the "egotistical Freddie goes out of control" path and all the cheesy melodrama that produces, it heads off the rails. On the positive side, the acting works well, and Malek does nicely as Freddie. I don't think he deserves an Oscar, but that's due to the massive flaws of the screenplay. By this I mean the script leaves Malek with such a thin, simplistic character that he doesn't get room to breathe. He delivers a charismatic performance but not one with great inner life because the screenplay doesn't allow him the chance to blossom. Otherwise, I can't find much to praise about this inane, mawkish mess of a movie. There's a fascinating story to be told about Freddie and Queen, but this simplistic tripe doesn't do the job. Bohemian Rhapsody appears in an aspect ratio of approximately 2.39:1 on this Blu-ray Disc. This became an appealing presentation. Rhapsody went with a heavily orange and teal palette typical of modern films. Within the movie’s color design, the tones seemed solid. As for the film’s DTS-HD MA 7.1 soundtrack, it proved to be unusually ambitious for its genre, though as expected, music dominated. With a wide variety of performances, the songs filled the side and rear speakers on a frequent basis. That was par for the course, but the way the mix used effects came as a surprise. With some “action elements” like jets and other escapades, the track opened up in a broad manner on more than a few occasions. These gave the situations more range and scope than I anticipated. Audio quality seemed fine. Music showed pretty good pep and power, with songs that came across with nice clarity and range. Effects were similarly full and accurate, while speech seemed distinctive and concise. The track worked well for the flick. Despite the movie’s success, only a handful of extras appear here, and the first offers the Complete Live Aid Movie Performance. This lasts 21 minutes, 55 seconds and expands the 13-minute, 25-second segment seen in the film. Don’t expect “Complete” to stay focused solely on the concert stage, though, as it includes the same cutaways to other characters found in the final flick. Really, “Complete” acts more as an extended scene, one that mainly benefits from the addition of “Crazy Little Thing Called Love” and “We Will Rock You”. Though it doesn’t add much not found in the finished flick, “Complete” still offers a nice bonus. Too bad the disc doesn’t give us a split-screen comparison to the actual Live Aid performance – I guess I’ll just have to synch the Blu-ray to my Live Aid DVD! Next we get Becoming Freddie, a 16-minute, 13-second piece with comments from producer Graham King, Queen members Roger Taylor and Brian May, movement coach Polly Bennett, music supervisor Becky Bentham, vocal coach Annie Skates, director of photography Newton Thomas Sigel, makeup/hair designer Jan Sewell, costume designer Julian Day, and actors Rami Malek, Joe Mazzello, Gwilym Lee, Allen Leech, Ben Hardy and Lucy Boynton. “Becoming” covers Malek’s casting as Mercury as well as aspects of his performance and elements connected to his transformation. Inevitably, some of this revolves around praise for Malek, but we still get a nice view of the ways the film brought out Mercury. 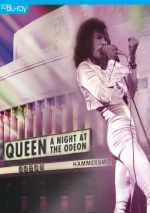 The Look and Sound of Queen goes for 21 minutes, 44 seconds and presents notes from Malek, Hardy, King, Mazzello, May, Lee, Sewell, Day, supervising sound and music editor John Warhurst and production designer Aaron Haye. With “Look”, we cover the story’s path to the screen, cast and performances, May and Taylor’s involvement, sets/locations, and other character elements. In addition to three trailers, the disc ends with Recreating Live Aid. The 19-minute, 55-second featurette includes info from King, May, Taylor, Malek, Lee, Hardy, Mazzello, Haye, Sigel, Day, Sewell, Bennett, concert lighting director Tony Simpson, visual effects supervisor Paul Norris, DNEG supervisor May Leung, visual effects producer Tim Field, VFX sprite system R&D supervisor Ted Waine, and DNEG 2nd supervisor Andrew Simmonds. As expected, “Recreating” tells us how the movie brought the big Live Aid sequence to the screen. Like the other clips, it leans toward happy talk, but it also provides useful insights. I’m Still Annoyed update: King doubles down on the lie that Queen reunited for Live Aid, though May acknowledges the band had just finished a tour. Also, Taylor claims Live Aid offered the first time rock musicians organized an event for the greater good. That bizarre statement immediately caused George Harrison to spin in his grave. A second disc presents a DVD copy of Rhapsody. It provides the Live Aid set but lacks the other extras. A massive hit, Bohemian Rhapsody suffers from massive flaws. Too fictionalized and too schmaltzy, the movie wastes good acting and a strong real-life story. The Blu-ray provides very good picture and audio along with a fairly informative set of supplements. Rhapsody brings a botched biopic.